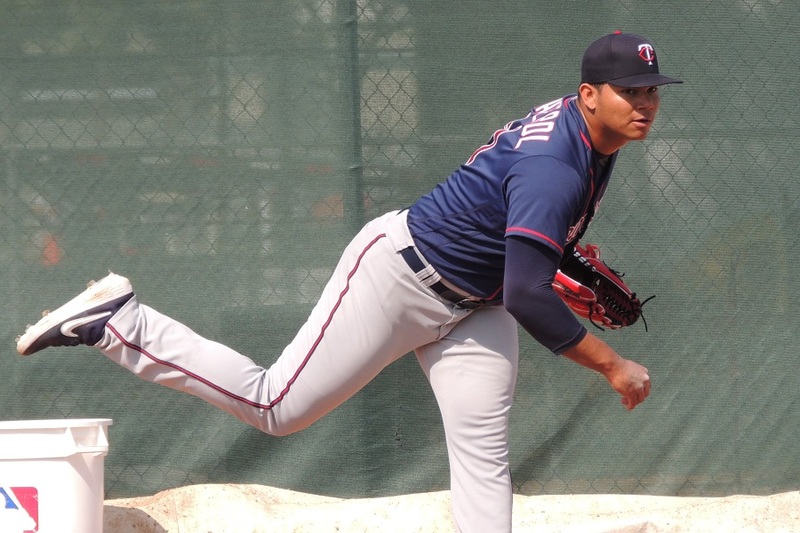 It was a night of top pitching prospects in the Twins minor league system on Thursday. Check out how Lewis Thorpe, Brusdar Graterol, Jhoan Duran and Jordan Balazovic did in their second starts of the season. Find out how each did, as well as how their teammates and teams did on Thursday. The Red Wings announced that RHP Chase De Jong was back on their roster after being optioned by the Twins. RHP DJ Baxendale was removed from the injured list. Also, RHP Sean Poppen was transferred back to AA Pensacola. Cedar Rapids announced that catcher David Banuelos was on the 7-Day IL with a concussion. RHP Tyler Palm also placed on the IL. RHP Derek Molina and 1B Gabe Snyder were promoted from extended spring training . It was the home opener for the Rochester Red Wings at Frontier Field on Thursday. Lewis Thorpe was back on the mound for his second start of the season. In his first start, he was charged with nine earned runs in four innings. He was better this time. He gave up six earned runs on seven hits and five walks in 4 2/3 innings. He struck out five. Thorpe gave up three in the first inning and one in the third inning. When he left with two outs in the fifth inning, he left two runners on. Ryan Eades allowed both of those runners, plus one more, to score. Eades did throw two scoreless innings after that fifth frame finished. He struck out three and didn’t issue a walk over his 2 1/3 innings. DJ Baxendale came on and threw a scoreless eighth inning. Unfortunately in the ninth frame, he was charged with six earned runs on five hits and two walks. Mike Morin finished the ninth by getting all three outs. Luke Raley provided much of the offense. He went 3-or-4 with his first homer of the season and three RBI. John Andreoli was the only other Wings hitter with multiple hits. He was 2-for-5 with his second double. LaMonte Wade walked twice. The Red Wings, now 2-6, have played quite poorly early in the season. They have statistically been the worst defensive team in the International and from what I have watched, it is earned. Brusdar Graterol picked up his first Double-A win on Thursday night with a real solid performance. The hard-throwing righty gave up three hits and walked three batters over 5 2/3 scoreless innings. He struck out four batters. He left the game with a runner on second and two outs. Tyler Jay came on and got the final out of the sixth inning quickly. Jay was charged with two runs (1oneearned) in the seventh inning. He gave up two hits and walked one in that inning. Dusten Knight came on and gave up a run in the eighth frame. But he pitched a scoreless ninth to preserve the win and earn his second save of the season. He struck out four in the two innings. And, as he does when he closes out a win, Knight does a backflip. The Blue Wahoos got three hits from Luis Arraez. Jordan Gore and Jaylin Davis each had a single and a walk. They got an RBI single from Mitchell Kranson to take the lead in the first inning. In the sixth inning, Jimmy Kerrigan came through with a two-run double to give the team a 3-0 lead. They added a fourth run on a error by the pitcher. Jhoan Duran made his second start of the season. He gave up single runs in the second and third innings. But he pitched pretty well again. In five innings, he gave up those two runs on three hits. He walked just one and struck out five batters. 46 of his 66 pitches were strikes. Melvi Acosta came on in relief and pitched pretty well, though it may not look it. Acosta gave up three runs (one earned) on three hits, a walk, and a hit batter over the final four innings. But he threw three scoreless innings before the three-run ninth. Acosta did get some help from his defense. He loaded the bases with two outs in the seventh inning, but Royce Lewis made a diving catch to his right to make a great catch that kept the Miracle in the ballgame at the time. Hopefully we’ll get some video at some point, but here is a report from someone who was there. The Miracle offense managed just five hits in the game. Trevor Larnach had two hits and a walk. It was his second straight multi-hit game. The Miracle fall to 4-4 on the season. Jordan Balazovic had another impressive outing. He struck out two batters in each of the first four innings of the game. In the fourth inning, he gave up his first two hits and a run. He struggled in the fifth inning. He left the game with the bases loaded and two outs (one one a strikeout). Derek Molina came in and got a ground ball to shortstop. But the throw to second base was to slow and late, allowing a second run to score and be charged to Balazovic. Molina then got a strikeout to end that inning. Balazovic’s final line? He gave up two runs on four hits and two walks. In 4 2/3 innings, he struck out nine batters. Molina struck out four batters in his 1 1/3 innings. But in that sixth inning, he gave up four runs on three hits and a walk, the biggest hit was a three-run homer that pushed the Kernels’ deficit to 6-1. Jose Martinez gave up an unearned run on two hits and a walk over two innings. Infielder Joe Cronin came in to pitch the ninth inning and worked a 1-2-3 innings. He led off the bottom of the ninth with a double. He later scored on a double by Michael Davis, who took over at shortstop when Cronin pitched. Trey Cabbage went 2-for-5 in the game and is now hitting .458. He has at least one hit in all six games he has played. He has had four multi-hit games. Gabe Snyder, in his first Kernels game, went 2-for-4. Andrew Bechtold also went 2-for-4 in the game. Cronin also went 2-for-4 with the double. The Kernels fall to 2-6 on the season. After their first 250 at-bats (collectively), Fort Myers team BA is .201 and team SLG is .297. Was looking forward to watching them given the very large number of top-20 position players in the lineup, but so far in my two attempts it's been like watching paint dry. As a group, still getting their BB, and not striking out a ton...but still waiting for the base hits, and x-base hits. Thorpe has always been somewhat finesse over stuff, hopefully this isn't him getting to the level where his stuff no longer plays. Yeah...when I see such awful results out of the gate, my mind goes to the same dark place...or that he has an injury that he's not disclosing. Hopefully, neither. But it sure would feel 100% better if he posted even one positive outing soon. The only things we (fans) have seen from him so far in 2019, including the ST game appearances, have been bad. Can't help but think Graterol is just wasting bullets in the minors. Well, he only pitched 102 innings last year, so not too many bullets, at least. And now that he's at AA, and he requires a 40-man spot after the season anyway, perhaps we'll see him in MLB before too long. Alcala and Jax are in a similar spot at AA. That's a fair question and admittedly I'm looking at 1.) them being worst in the league in fielding percentage and 2.) watching parts of 3-4 of their games so far, and 3.) conversations. I think - and again, it's probably too early to make too many grand statements - that a lot of them are adequate defenders, average defenders or slightly below. Adn that probably plays OK on a team where you've got a few guys that are above average in those areas.. I mean, if Brent Rooker is in LF, it'll be a step or two or three down from Rosario. But you can adjust Buxton and Kepler two-three steps to their right and you help minimize it some. Also, I think that playing with really good defensive players around you helps you up your game. That's all philosophical and guessing, of course. On the OF, I think Wade and Raley can be a solid corner OFers defensively but one is playing out of position in CF now. As to Rooker, I would expect him to be a below avg defender. So, realistically, the Red Wings are playing two LFers and a 1B in the OF on most nights. That explains a lot. That might also explain why the last 2 trades concentrated on athletic CF types (Zeigler and Andreoli) rather than guys who hit. Looks like we need a CF for the AAA club, although I think Andreoli is there but not playing. It might just be early in the season ,so the fielding percentage isn't a big deal. The OF isn't terrible, but there isn't a rangy CF in the group. They all do fine with what they get to. Wade is pretty good but again, probably not a CF (which is fine). With the names you mention and I expect many others, gonna be some real teeth grinding coming out of Target Field come November.Expect there is going to be some real talent exposed to the Rule 5.Hopefully, some of it will be dealt this summer so we get something in return. Actually, Andreoli seems to be playing center most nights. The other outfielders are rotating thru the DH spot. So all 4 are in the lineup most nights. So far, Wade has played 8 games. Raley has the fewest with 5 and the fewest ab's with 16. Wiel is in the mix somewhere as he has 6 games and they aren't all at first probably because of Rosario. That's another thing to keep in mind here -- Balazovic is repeating the level. Not that he's old, of course, but he has faced this level of competition before, which might explain some of his hot start. Also, while he's been very good through 2 games, he hasn't been as efficient as one might like to see. 83 pitches and he didn't finish the 5th inning in this start. Outs and strikeouts are nice, but it seems like the best prospects can put away minor league hitters with a bit more efficiency. Obviously still very early in the season, and early in Balazovic's career, so plenty of time for him to improve -- but it's also probably still early to say Law was right and others wrong too. He's kind of on the Gonsalves timeline. And I know Gonsalves has told me that it was a good plan for him. Finish a year with 10-12 starts at a level. Learn stuff. Go to the offseason. Work on stuff. Go back there, make another 10-12 starts, move up about the halfway mark, and repeat all the way up.I was thinking about that as it relates to Balazovic, and I really like it. "Repeat the level" to me means spending a full year at a level. 10-12 starts isn't a lot at all. And strikeout pitchers tend to throw more pitches, and in the lower levels, there can be more 3-2 types of counts. A quick look at those top prospects, and they're all 19-21 and playing against guys who are 23-24 (obvious exceptions on both sides). Baddoo is playing his first games there. Miranda and Lewis weren't there for long. Jeffers, Larnach and Helman were 2019 picks trying to figure their way on and off the field still. My point isn't that we shouldn't expect them to improve. They are all immensely talented and most likely will work their way through it. Prospect status doesn't always equate to on-field stats and wins.